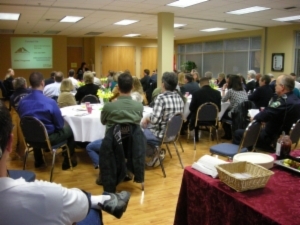 The City of Covington has rental space available at City Hall for meetings, socials, classes, seminars, party events, receptions and other gatherings. This room is available during regular City business hours as well as evenings and weekends. The room is approximately 1,500 square feet with hardwood floors and windows on two sides. There is an attached kitchen with full size refrigerator, stove and dishwasher that is available for an additional fee. Rental includes tables and chairs for 90. Set up and clean up is the responsibility of the renter and needs to be included in your rental time. Links to reservation forms and rental procedures and regulations can be found on the left sidebar for your information. Please contact the Front Desk at 253-480-2400 ext. 2404 for additional information and availability. $30/hour M-F 8 a.m.-5 p.m.
- Liquor license and insurance required for all events serving alcohol. - Recommended event sizes limited to 90 for sit down events and 120 for reception events.